Make tahini is easy if you have a cheap coffee grinder with a blade. Make tahini is so easy if you can't find it in a local Turkish or Greek shop; you simply can't make hummus, the queen of side dishes for a green salad without the sesame paste. 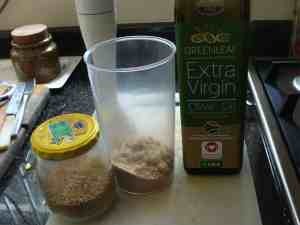 All you need to make tahini is an oven and a cheap electric whizz coffee grinder and a hand blender. In fact I now often toast them in a deep frying pan on the hob. You know those sesame seeds on a bun? They look pretty and help sell an otherwise uninteresting, nutritionless, high GI white hamburger; junk food actually. If you chew your bun thoroughly it will have a decidedly interesting taste, but otherwise those sesame seeds are almost completely wasted. They pass straight through the intestines without being digested; in short, they are worthless. In fact, if you have diverticulosis, they may well be harmful to your gut. Rather learn how to make tahini which is made from toasted and then ground sesame seeds; then spread the paste on your bun. Now it's delicious and easy to digest. 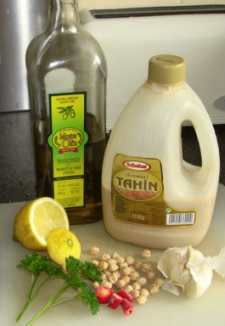 This is my very simple recipe for tahini. 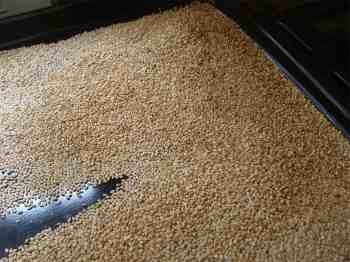 First, pour the tahini ingredients, just sesame seeds, not too thickly on a roasting pan. Then simply toast them under the grill until they go a pale brown and start crackling, in fact; stir, or shake the oven dish, so they don't burn. It takes about 3 to 5 minutes. Put the dish right up high in the oven, but do watch them; they can burn very quickly. That's why I now do them on the stove top. 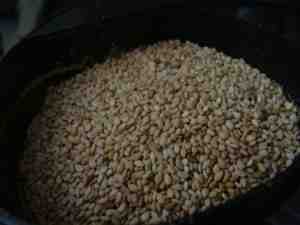 Pour the toasted seeds into an airtight container and refrigerate; better still freeze them. Pour the toasted seeds as needed into your coffee blender; really, homemade tahini is a breeze. Because the sesame seed is encased in an air tight hull to protect the vulnerable fatty acids from oxidation, your must keep it cold once you've blended them. It's very little stress on the blender, so any cheap blender is fine. A cheap coffee and spice grinder is perfect; it's usually less than 20 dollars. Grinding sesame seeds is a vital part of the process, otherwise they pass through the bowel undigested, and may even cause a problem in diverticuli. Make tahini is easy with this cheap blender. 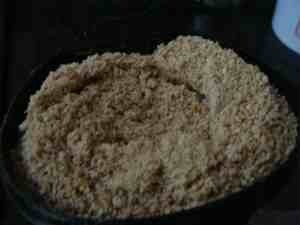 Make tahini involves simply grinding toasted sesame seeds, adding some olive oil, and then blending. And in ten seconds you have this fine sesame seed powder. Grinding sesame seeds couldn't be easier. For real tahini recipes, you would want to add sesame oil, but I have a problem with most seed oils. They are solvent extracted and heated to very high temperatures in the industrial process. So, instead I use olive oil which is cold pressed and never solvent extracted. Obviously extra virgin is better. Pour a tablespoon of olive oil over your finely whizzed sesame seed powder, and it's almost ready for your tahini recipes. Voila, sesame paste, what could be easier. You can either use a fork to make tahini, but I usually use the stick blender, and go straight on to make my tahini recipes which require the blender. 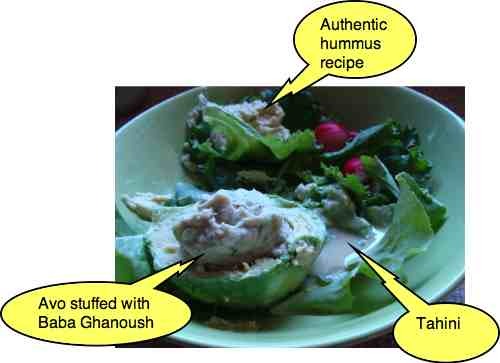 Which is often our special, simple authentic hummus recipe. Always buy a minimum of 300W blender; the measuring cup is very useful too. Don't use it for blending ice cubes. Perfect for your smoothie too. Add a piece of chicken, or feta cheese, and you have the perfect lunch. Low in carbs, fairly high in protein, loaded with phytogens, and the high quality, healthy fatty acids found in olive oil and your homemade tahini. Oh, and a little butter. That you can definitely indulge in if you are eating these sorts of meals on a regular basis. These are the foods that lower cholesterol so don't be anxious. Certainly avoid hydrogenated foods like margarine. Trans fatty acids are a poison to the body. Avoid them if you want to live long in the land and get to your grandchildrens' weddings. i do. A minimum of five colours per day. How many can you count in this one meal. Those pepperdews incidently are the second highest source of natural vitamin C after citrus. Oh, and a squish of lemon juice, of course, and dribble with olive oil. And parsley is the highest plant source of vitamin K. Bruise easily? Sesame and flax seeds are an especially good source of lignans; they contain an oestrogen like compound that blocks the cancerous effect of your hormones on sensitive tissues like the breast. Make tahini is excellent on a salad, and I often enjoy it on our homemade sourdough bread recipe, with a swipe of butter and then use it to mop up the juices left over from your salad. Are phytates bad is a question that concerns some folk. As you make tahini you may worry about the absorption of calcium and iron, for example. These are legitimate worries, but the research was done on added phytic acid; in it's natural form, the effect is minimal. Nevertheless, if you have concerns, then read the page are phytates bad? Both bran and legumes like chickpeas and lentils, as well as seeds like those from sesame and flax plants have phytic acid. No doubt there is some loss of minerals due to phytate formation, but there's no evidence in the literature that vegetarians who get their protein from tofu, for example, are more likely to be anaemic or osteoporotic. Having said that, we don't recommend adding bran to your diet; there are better ways to deal with cholesterol. 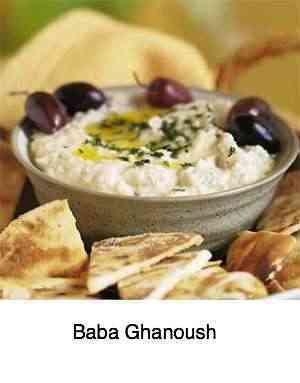 Make tahini is an essential ingredient of any authentic hummus recipe. It contains certain vital amino acids not found in the protein rich chickpeas. Without them vegetarians would become very ill.
Hummus makes an excellent side dish for any salad, and once you have have the ingredients, you can whip it up in five minutes. You'll need cooked chickpeas, make tahini, parsley, garlic and olive oil. 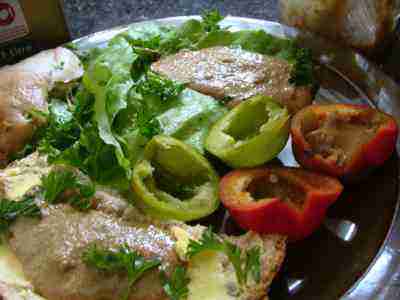 Many Mediterranean dishes for this reason contain tahini. Turkish helva is one of them; a delicious fudge of honey and tahini. Recipe for sesame chicken is another delicious Lebanese dish but here the tahini is used for its flavour; chicken has all the essential amino acids. Go from Make Tahini to healthy flour. 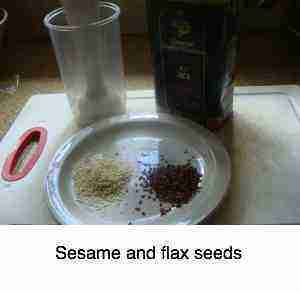 after grinding up our sesame seeds, I'll usually do some flax seeds at the same time. She who must be obeyed throws a tablespoon of each of the ground seeds into her bread dough, and we have a teaspoon of each on our cereal each morning. Always use freshly ground seeds, and freshly cracked nuts, by the way. One of their virtues is their highly antioxidant oils, which themselves are very rapidly oxidised when exposed to air; go rancid, lose their nutritional value, and actually form harmful breakdown products. The good Lord put a tightly fitting skin or shell around them for a very good reason. They have anti-cancer, anti-arthritis properties and help prevent inflammation of the blood vessels. Make tahini is part of the solution. I mentioned diverticulosis at the beginning of this page. It's a nasty condition, entirely preventable by avoiding constipation, the GREAT ENEMY. All fibre, but particularly that which is soluble is what prevents constipation. And nothing beats beetroot and apples, prunes and a green salad for soluble fibre. For quick constipation relief think of these foods, and not bran. Not that I have anything against bran; in the context of healthy flour, it's a rich source of lignans too. What's so special about sesame paste? And why on a chiropractic help site? Firstly, sesame paste is very rich in oleic acid. That's one of the healthy fats that coats your nerves. Without that myelin sheath, a fibre can't conduct impulses leading to diseases like MS.
Secondly, it's high in two essential amino acids in proteins, methionine and tryptophan, that vegans battle to get in sufficient quantities. That's only of interest if you are seriously vegetarian. However, a diet rich in methionine has dangers if one isn't consuming enough of the B vitamins. They are necessary for the methylation of homocysteine, a toxic breakdown product of methionine metabolism; for this foods rich in choline, folate and B12 are essential. Choline food sources are not a problem for vegetarians. However, vegans have difficulty getting enough of it, and B12 too. Buy or make tahini is really for everybody; it's delicious. And thirdly sesame seeds are full of phytosterols, the plant compounds that help prevent raised animal cholesterol in humans. That's for those who seriously love their red meat and dairy; people like me. It's all about balance; we're on a tightrope. Finally, to lower the glycemic index of a carbohydrate, meaning how quickly it's turned to blood glucose, one needs to add fat and protein. Sesame seeds qualify on both counts. So, spreading tahini on your bread, absolutely one of my favourites, turns it into a low GI loaf. Carboydrate Count Chart and Glycemic Index. All in all, make tahini is a sensible strategy for every family, particularly as it's so easy. The taste beats peanut butter, hands down. Healthy food made fast is our slogan. All that heating and grinding we do with solar power. Ever thought of going green? A solar powered generator is something any handyman can build himself. Struggling with issues of Lesbianism? After a very strange, vivid dream, being a hot-blooded heterosexual, and a conservative Christian, I went in search of meaning into the whole subject of homosexuality. 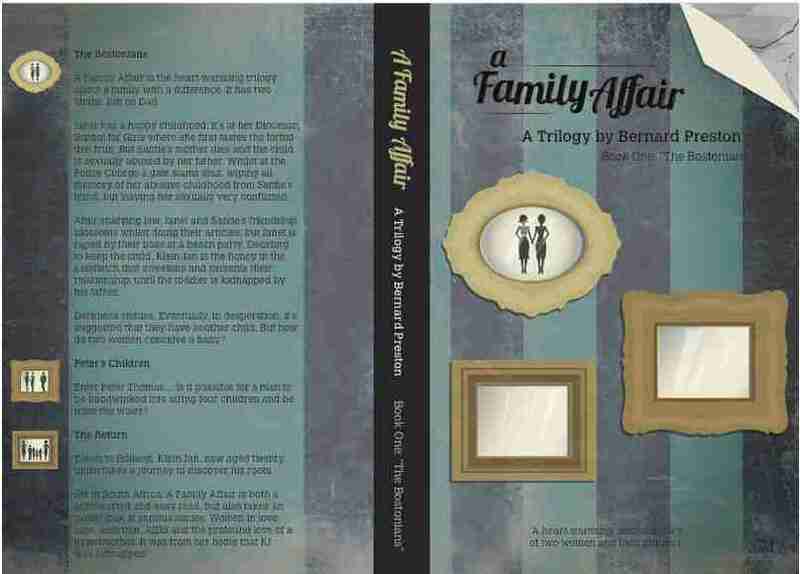 I won't pretend I have found entirely satisfactory answers, but if you too are pondering these issues, I'm sure you'll love my fourth book, A Family Affair. It's a trilogy actually. Says a reader: "Another page-turner from a natural story-teller!" It has nothing to do with make tahini! Writing is just another of my many interests. 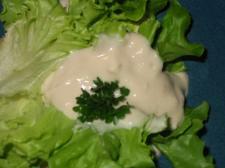 Helens 15 euro salad ..